Thiruvathirai festival is observed on the Thiruvathira Nakshatra day in the Malayalam month of Dhanu Masam (December – January). Thiruvathirai Festival 2020 date is January 10. 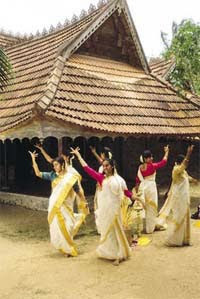 Thiruvathirai is also the name of a famous dance form of Kerala and it is performed on the day. The festival is mainly dedicated to Lord Shiva and there are two popular beliefs – one is that on the day Kamadeva was burned to ashes by Lord Shiva. Another legend is Lord Shiva’s return to the world after ending harsh austerities and tapas that he was performing after the death of Goddess Sati. From prehistoric times, Malayalee woman enjoyed an enviable position in the society, and she was practically the mistress of her house. The elevated position she occupied at home and in the society had distinguished her from and in the society had distinguished her from her neighbors and influenced to a considerable extent the social structure, customs and religious practices of the people. The culmination of this phenomenon is clearly visible in setting apart one of the three great festivals of Kerala viz. Thiruvathira, exclusively for womenfolk, for which a parallel can hardly be found in any section of the Indian Society. All the rituals and pujas are dedicated to Lord Shiva. On the Thiruvathira day women fast and avoid rice meal and eat only preparations of wheat. Other food items include plantain fruits, tender coconuts, etc. They also chew betel and redden their lips. The first Thiruvathira coming after the marriage of a girl is known as Puthen Thiruvathira or Poothiruvathira. This was celebrated on a grand scale earlier but today most people skip the functions. Oonjal Attam, swinging on an oonjal (swing) is an item of amusement on the day. On Thiruvathira night, women keep vigil for Shiva and perform Thiruvathira kali or Kaikottikali. They stand in a circle around lighted brass lamp, and dance each step at the rhythm of the songs they sing, clapping their hands. Another popular custom on the day is known as the Pathirappoochoodal, meaning wearing of flowers at midnight. At the midnight of Thiruvathira, an image of Lord Shiva is placed at the central courtyard and flowers, plantains and jaggery are offered to the deity. They then perform Kaikottikali around the deity. Flowers are taken from the offering and worn by them. Several dishes from tubers are prepared on the day and one of the most famous dishes is the Thiruvathira Puzhukku made from elephant yam and other locally available tubers. The neighboring state of Tamil Nadu celebrates the Ardhra Darshan on the day – it is the festival dedicated to the Nataraja dance of Shiva.